Some decisions in life are complicated. To Greg Holder, choosing to help others shouldn’t be one of them. A longtime volunteer for Dorcas Ministries, he says it’s simply the right thing to do. Indeed, Holder’s work here began as a second-Saturday commitment in 1997, when he first heard of Dorcas Ministries through his church, St. Francis United Methodist in Cary. Dorcas Ministries, named for the biblical seamstress known for her generosity to the disadvantaged, was founded in 1968 in Cary with the mission of helping local people in need. Now a collaboration of some 20 area churches of various denominations, it helps those in crisis with food, shelter and clothing, and offers services such as childcare tuition assistance and JobLink access. Dorcas has provided almost $2 million in assistance over the past five years, according to Executive Director Howard Manning. Its programs are funded largely through proceeds of the Dorcas Thrift Shop, which sells new and gently used clothing and household items. By vocation, Holder wholesales industrial supplies to distributors, and he holds a degree in criminal justice from the University of North Carolina at Chapel Hill. In the years since joining Dorcas’ team of 250 volunteers, he’s expanded his service to second, fourth and fifth Saturdays, usually manning donation drop-offs. “I knew nothing about thrift shops, but my first job was at the grocery store in high school, so I’m familiar with retail. I’m in my element here,” Holder said. In recent months he and Gary McKinney, who also serve as facility managers, volunteered nearly full time at Dorcas, overseeing the organization’s move from Maynard Road to a nonprofit plaza, which opened Oct. 1. 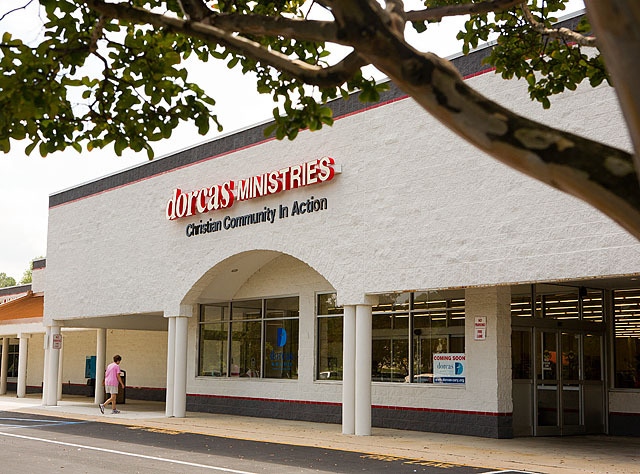 Dorcas Ministries purchased the Cary Plaza shopping center on High House Road for $3.6 million in 2008, and spent an additional $900,000 on renovations and capital improvements. Holder and McKinney were heavily involved, laying out floor plans for the new store to maximize shopping flow, overseeing building renovations and physically helping to make the transition. 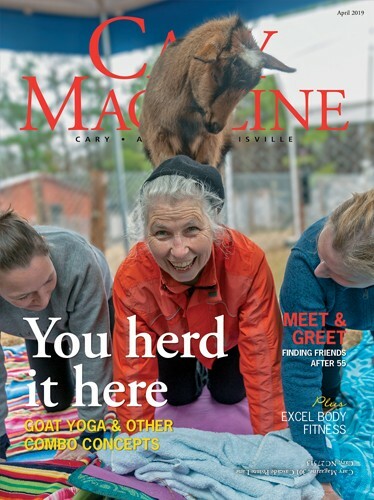 “By offering his services to maintain our facilities and making arrangements with vendors and contractors free of charge, Greg allows a big percentage of funds that were being spent as overhead on maintenance to be reallocated to our main mission,” Manning said. “I’m a very small cog in this machine. It’s a collective effort,” Holder is quick to point out, crediting the entire volunteer team, and the citizens who for years have generously donated their money and goods to the cause. Dorcas’ new store, a former Food Lion, has double the retail floor space, boosting its fundraising potential, vastly expands space for administration and client services, and increases parking from 38 to more than 200 spaces. Dorcas has transferred its full operations here and leases remaining space to fellow nonprofits including the Habitat for Humanity ReStore, to offer a one-stop experience for bargain hunters and donors alike. Dorcas’ three-year payoff strategy includes selling the Maynard Road site and raising funds through a two-phase capital campaign. A half-million dollars has been raised to date. By seeing true need firsthand, Holder says his volunteer work helps him maintain life’s perspective. “There is always somebody who needs help,” he said. “It’s not always obvious; you can drive around some sections of town and you’d never know. This is one way to cover a wide range of those needs. For more on Dorcas Ministries’ new shop, visit www.carymagazine.com.